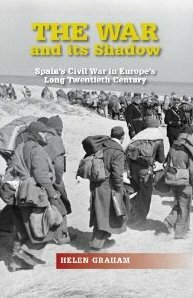 The War and its Shadow: Spain’s Civil War in Europe’s Long Twentieth Century, by Helen Graham, Portland, OR: Sussex Academic Press, 2012. 250 pp. Many subjects thread through the pages of Helen Graham’s dense but brilliant meditation on the Spanish Civil War, the fruit of more than a quarter century as a scholar of this period. It would take thousands of words to do justice to them all, so I will limit myself to only a few. The first has to do with the nature of Francoism, which not only became a machine of mass murder but also forced its enemies to make public acts of submission. Graham tells the chilling story of Matilde Lande, an educated, secular, professional woman (three strikes against her right there) who found herself a political prisoner in Mallorca in 1942. The regime demanded that she recant her beliefs and have a public baptism. Unable to endure the pressures on her—which likely included torture—she committed suicide by throwing herself off a prison balcony. But during the 45 minutes she survived, a priest was summoned to give her last rites. And the regime did not return her body to her family but instead gave it a Catholic burial. There is an echo here of the Inquisition’s fury at heretics, and perhaps also of the way Stalin’s victims were forced to sign a confession before being dispatched to the firing squad. Hitler, by contrast, was content to merely turn on the gas. The brutal nature of Franco’s regime—which, Graham reminds us, had killed or enslaved a vastly greater number of its own people than had Nazi Germany prior to the start of the Holocaust—raises the question: why has the dictator gotten such a free ride from critics of totalitarianism? He is seldom mentioned in the same breath as Hitler, Mussolini and Stalin, and the United States built military bases in Spain in the 1950s, President Eisenhower paid the caudillo a friendly visit in 1959, and President Ford did so in 1975. In those years, of course, anti-Communism trumped everything else in American foreign policy, but Graham situates this in a much larger context, which is really the central theme of her book. The Spanish Civil War was not merely a conflict in one country, she points out; it was part of a broader civil war that, hot or cold, pervaded much of Europe, from 1918 until well after 1945. In the 1930s the Spanish right wing believed in an idealized, hierarchical, highly rural Spain, recapturing the glories of its imperial past and unpolluted by subversive outsiders, whether these be Bolsheviks, Jews, Masons, uppity women, homosexuals or egalitarian-minded city-dwellers. This was not unique in Europe; not only Germany and Italy, but many other countries had right-wing regimes, often with an anti-Semitic tinge, such as Poland, Hungary, Romania, and Greece. And even in functioning democracies, like France or Britain, the fascist or semi-fascist right was vocal and sometimes violent. Who won the continent-wide civil war? In the end, the cosmopolitans rather than the believers in national purity: consider the European Union, any meeting of which certainly looks a lot more like the International Brigades than it does like a gathering of Franco’s Legionnaires. But murderous echoes of that war could be heard only 20 years ago in the Serb siege of multiethnic Sarajevo, and more reverberations still sound today. In many European countries, resurgent right-wingers are once again blaming the continent’s economic troubles on outsiders, whether they are immigrants, Gypsies, Muslims or some other scapegoated minority. In what strikes me as the most original of all her observations, Graham points out that even the Allies of World War II, after fighting a war supposedly to rid Europe of Nazism and its entire way of thinking, nonetheless implicitly accepted what she calls a “toxic myth.” This was “the Hitlerian principle that ethnic homogeneity was the face of the future, and a desirable norm.” It was followed by the victorious Allies—including the Soviet Union–when, at the cost of several hundred thousand lives, they ruthlessly forced more than 12 million ethnic Germans to leave parts of Poland, Czechoslovakia and the USSR where they had lived for generations in the same territories as people of other ethnicities. For them and millions of other Europeans forced to leave their homes after 1945, the believers in national purity won Europe’s civil war. I wish I could say that Graham’s book was easy reading, but too often it is not. She has an odd, distracting habit, sometimes several times per paragraph, of surrounding a word or phrase with quotation marks when it is used with anything other than its most literal meaning. Her language is frequently elliptical, assuming the reader’s ability to fill in specific examples. And some of her most trenchant points appear only in the endnotes. I fear this means that her wide-ranging look at the Spanish Civil War will take longer than it should to reach the large audience it deserves. Adam Hochschild, the author of seven books of history, memoir and reportage, is working on a book about Americans in the Spanish Civil War.